Philippine mobile brand Cherry Mobile has just added an octa core smartphone on their Flare Line-up, it features 5-inch HD display, 1GB of RAM, 8GB internal storage and support USB OTG - the Cherry Mobile Flare S3 Octa. As mentioned, it is powered by an octa-core processor clocked at 1.4Ghz, coupled with Mali-450 GPU. The storage of the device can also upgrade up to 32GB. An android kitkat operating system is installed. The Cherry Mobile Flare S3 Octa is equipped with 13 megapixel rear camera and 5 megapixel camera on front. For ₱4,499 suggested retail price, it comes with 1,800mAh battery out of the box. 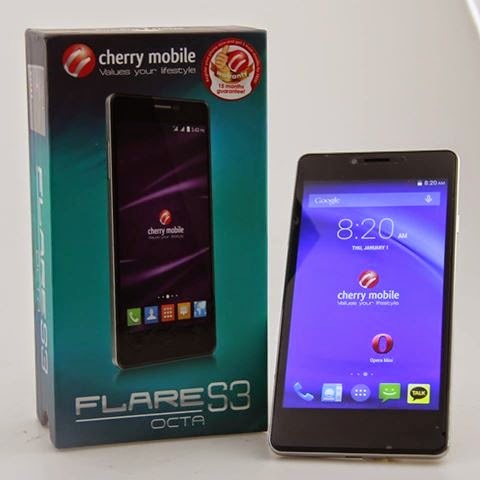 On February 28, 2015 at 1pm, the Cherry Mobile Flare S3 Octa will go on sale on some store including SM City North EDSA, SM Megamall, SM Southmall, SM City Calamba, SM City Dasmarinas, Robinsons Place Manila, Market! Market!, Ayala Center Cebu, Ayala Centrio CDO, and GMall Davao. The first 200 buyers will have a free 2,600mAh power bank.